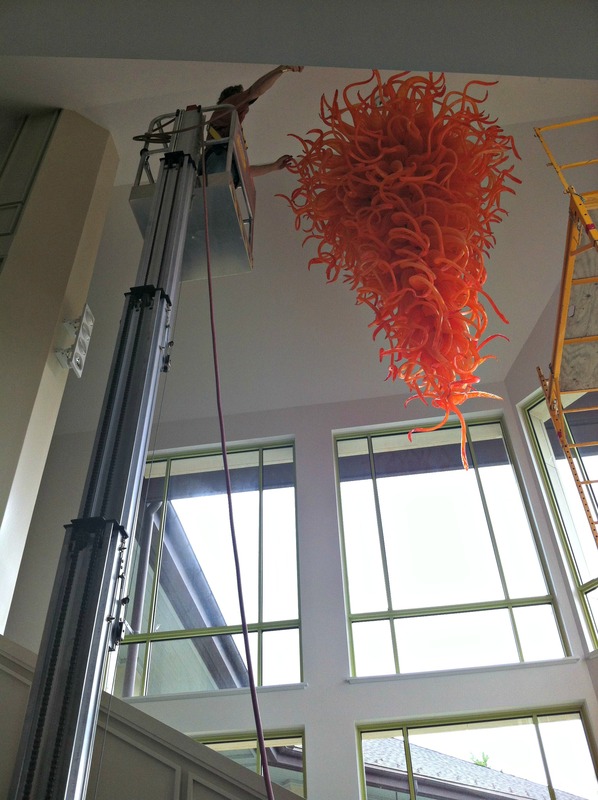 Ever wonder what it takes to maintain Dale Chihuly’s glass sculpture Chandelier? Our Exhibitions Designer, Lindsay Smith, tells us how it’s done. 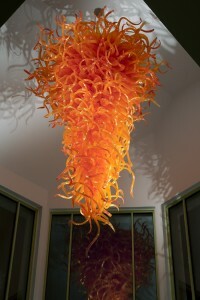 Chandelier must be cleaned on an annual basis. The project has roots dating back to 1998, when it was noticed that dust particles would readily settle upon the individual glass pieces creating a dusty film, diminishing the chandelier’s color. One to two days are needed to complete the project. Because of the location above the stairwell careful thought was needed to determine a structure for this cleaning. It was determined that this could be accomplished with several pieces of equipment that the museum regularly uses: a one-person electric lift, air compressor, soft wool or synthetic dusters, and rented painter’s scaffolding sections. The scaffolding is stackable up to three sections, plus it is narrow and adjustable in height to accommodate the elevation and width changes within the stairwell. 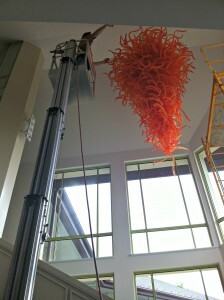 Working from the top of the chandelier down, the air compressor is used to blow away a majority of the dust particles. Then wool dusters are used to clean the top, bottom, sides, ends, and carefully between the individual pieces to the best of our ability.